As your child grows, he will gain skills that will allow him to be more independent. At this stage, each new learning experience is crucial because it helps him adapt to the world that surrounds him. After around their first birthday, children start acquiring new skills that allow them to rely a little bit more on themselves. Around 24 months, some of these skills involve beginning to dress themselves. Every child develops at their own pace, so some children may start earlier, and others later. Most children acquire this and more personal care milestones by the time they’re four years old. Once your little one turns two, it’s a good time to start teaching him how to dress himself. This is a challenging task and it will take a while until your little one can get dressed alone, but he will gradually dominate this task, improving with practice. This is an exciting time for your little one, as getting dressed like mom and dad do gives him a sense of autonomy. It doesn’t matter if he just puts on one little piece of clothing, always remember to praise him; it’s a big deal for him! 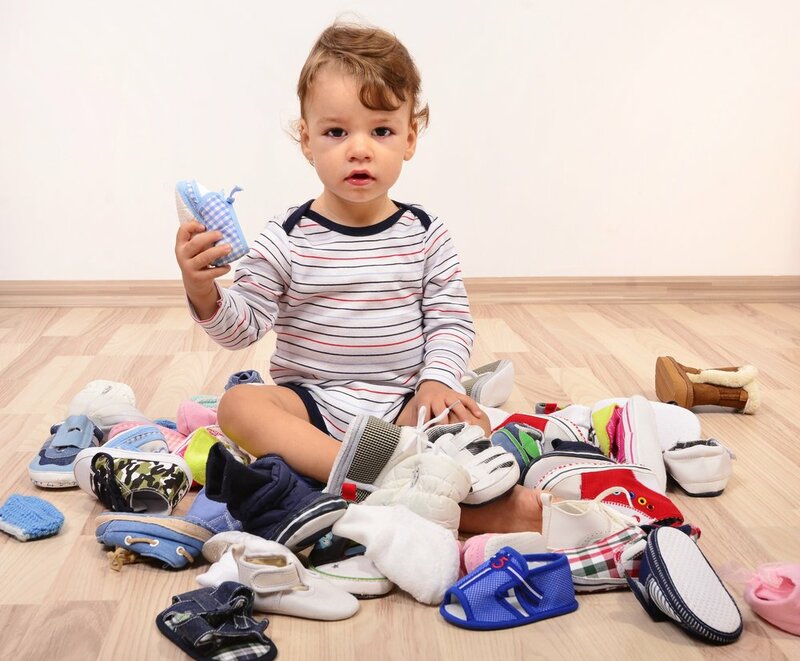 Likewise, don’t be surprised if your little one puts on his shoes the wrong way, it’s all part of the learning process. Start teaching him how to dress himself as soon as possible, always looking for signs of interest and initiative. Shirts with a wide neck and illustrations in front so he can easily identify which way to wear it. Always praise his achievements, however small they are. For our children everything is a big deal and it’ll motivate them to keep learning. Let your little one choose between two or three options of clothes, this will give him a greater sense of autonomy. Remember to choose between clothes that are easy to put on. Teach your child to find the labels on shirts and tell him these always go on the back. Do the same for pants, explaining that the large pockets also go on the back. If he starts buttoning up his shirts, teach him to begin from the bottom up so that he doesn’t skip any buttons. For shoes, you can draw two happy faces and tell your child that when the faces are facing each other they are in the correct position. Establish a routine. It may include a bath, getting dry, putting on pajamas, and having dinner. Make it fun! You can come up with a song for getting dressed or simply playing a special one. You can also count to see how long it takes him to get dressed, many children love to race against the clock. Find a good, relaxed time to practice getting dressed and don’t forget to be patient with your little one. What do I do when I’m in a hurry? We know that even though we want to let our child get dressed alone every time, the world moves at a fast pace and there isn’t always enough time. With this in mind, it is important to explain to your little one that there will be days when you will have to dress him. Mention that, instead, he’ll be able to practice at night with his pajamas or at another time. Also keep in mind that you’ll probably have to repeat instructions many times; children learn fast but require practice, especially with such a challenging task as this one.